CRE TECHNOLOGY is a genset controller manufacturer providing high technical solutions and services to industrial and marine genset suppliers, switchgear manufacturers, integrators and engineering companies. CRE TECHNOLOGY is in the generator and genset industry and specialized in protection and paralleling. GENSYS COMPACT MAINS is available in both switchboard panel mounted version with display, or core base mounted version. And compatible with i4GEN touchscreen color display. 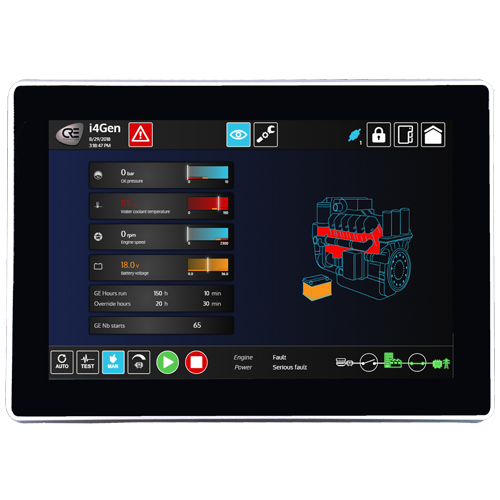 GENSYS COMPACT MAINS is configurable from its front panel display, from i4GEN, or through the free CRE PC software. Mains failure detection and No Break changeover with adjustable load transfer time and paralleling time. Possibility of Operator mains transfer validation (G59). Mains permanent paralleling in Fix load and PF control. Isochronous & Iso-voltage or Droop mode. Frequency and voltage control, compensation for generators with droop governors and/or AVR/DVR. Synchronization: Frequency, Phase & Voltage synchronization (Synch display available on screen). Synch Check (ANSI 25) + Phase sequence protection. New optimized PID loop with exceptional performance in synchronization, KW and KVAR control. 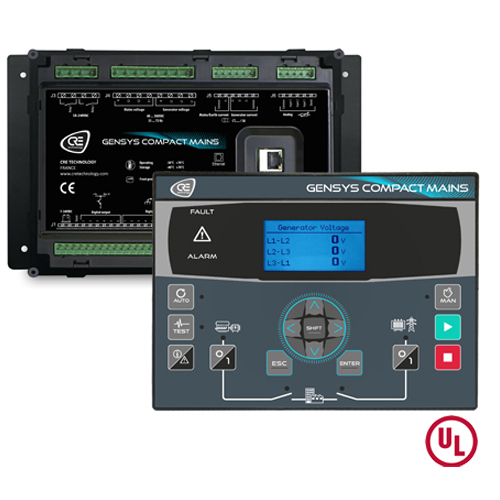 The GENSYS 2.0 Marine is a control unit designed for marine generator switchboards panels. Load sharing redondancy and heavy consumer function. 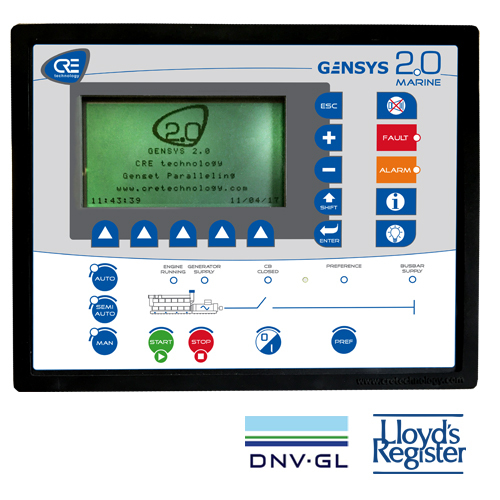 GENSYS 2.0 Marine is configurable via its front panel or via a PC with CRE Config software.